The “Body Painting” Pinterest board is the result of the continuing search for images that might provide inspiration for concepts, skin textures, hairstyles and props. Bodypainting has been around since earliest humanity. Since painting materials and pigments pre-date the first cave paintings, it is believed that these pigments were used to paint the human body. Most tribal cultures have, at one time or another, practiced bodypainting and used it, along with tattooing, dancing, loud group singing, rhythmic stomping and drumming during ritualized ceremonies. Modern examples of bodypainting extend from painted sports fans to Demi Moore’s famous Vanity Fair cover. 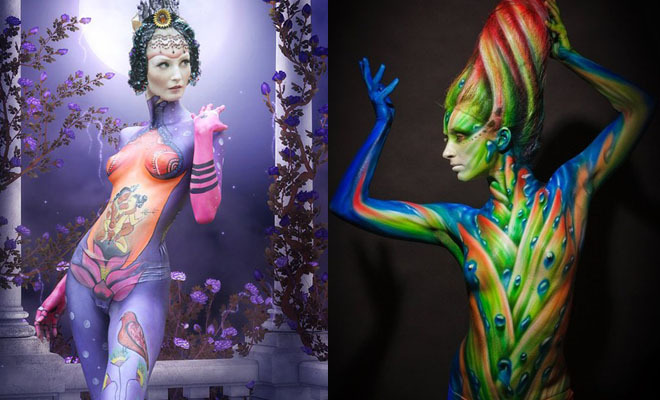 Although the phrase “body painting” may mean painting clothing on naked models for many, serious artists have raised the art form to astonishing levels. Combining the art of make-up with elaborate costumes, hairstyles, props and even prosthetics, the human body becomes a canvas for stunning, albeit temporary, works of art. Most of the images here come from the World Bodypainting Festival in Portschach, Austria, where each year competing artists from 40 different nations bring their remarkable creative visions to life. “Body Painting” board on Pinterest.